Guide to Krka River National Park - Explore Croatia Become a Patron! 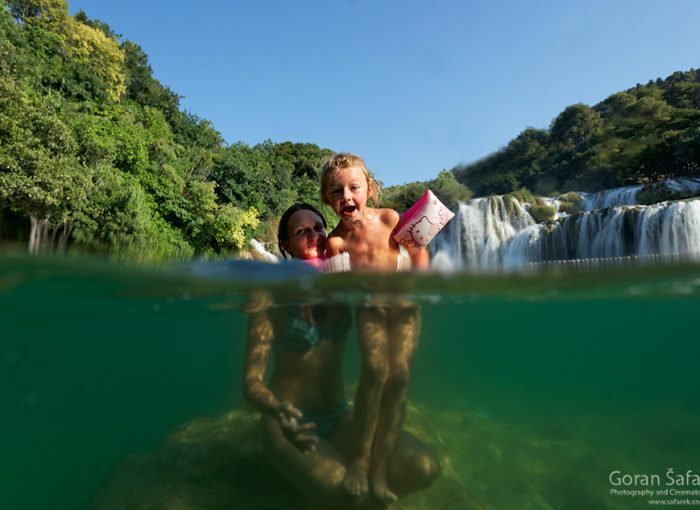 Krka is one of the most beautiful, and thanks to the proximity of the Adriatic coast near Šibenik, one of the most popular national parks in Croatia. Impressive waterfalls, deep canyon, and cultural heritage are just one of many attractions. The park is large, with many interesting spots to see. Here is the guide for Krka National Park in Croatia, to help you discover this artwork of nature. 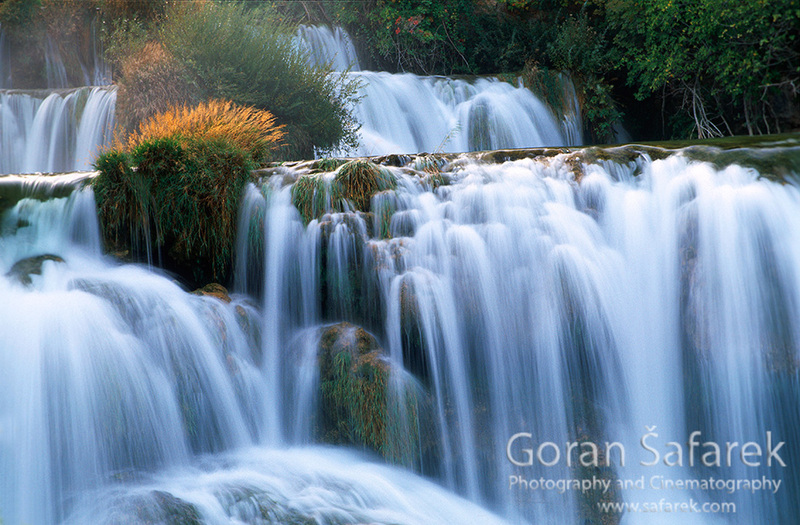 Krka is one of the most prominent Croatian rivers and also one of the most important. It is protected as a national park and has substantial natural value. It is also a tremendous economic asset as a tourist hot spot. 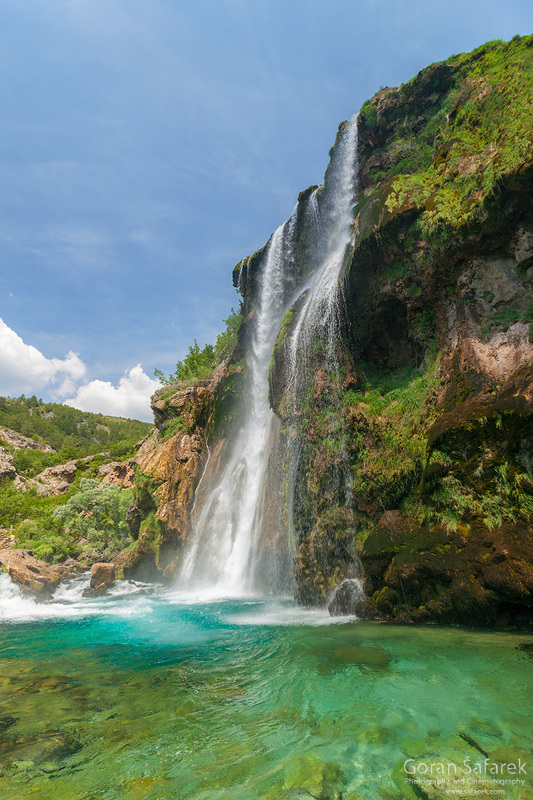 Skradinski buk waterfall in the summer is teeming with visitors, but there are many other attractions Read more about values of Krka National Park. 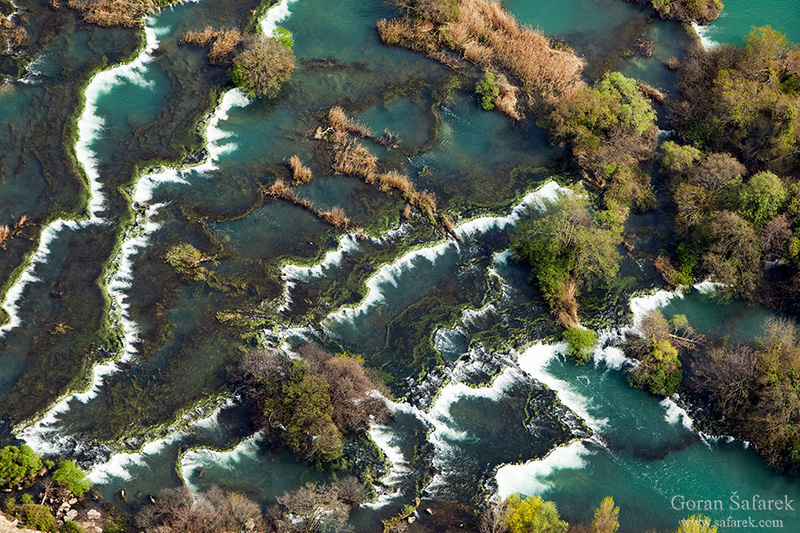 The Krka River is the defining natural landmark in the national park. The river is 73 km long and its basin covers an area of 2,088 km2. The river flow in a very harsh environment of the arid karst landscape of prickly bushes and especially in the summer, it is an oasis. It springs in the midst of the Krčić waterfall, on the edge of Knin Town. Then it flows silently in the karst plain, amidst alder and willow trees and small meadows. The river enters the shade of the canyon, though it flows almost till Šibenik, where it meets the sea. On the way, the canyon widens into valleys, while barriers with beautiful waterfalls slow down the flow in almost lakes. Near Skradinski buk, Krka receives the Čikola River,that flows from Drniš, in majestic canyon. This river often dries up even in the spring. As everywhere on the coast, the summer is a time of crowds, uncomfortable heat, and skyrocketing prices. If you can, visit the park in late spring or early autumn. In autumn, you will profit from the lusher waterfall. In August and July, come as early as possible in the day to beat the crowd. Krka National park is easily reached by your own car. The Zagreb-Split highway is nearby, just take Šibenik exit and then follow the signs. Old magistral road Zagreb-Split is also useful – turn near Knin. 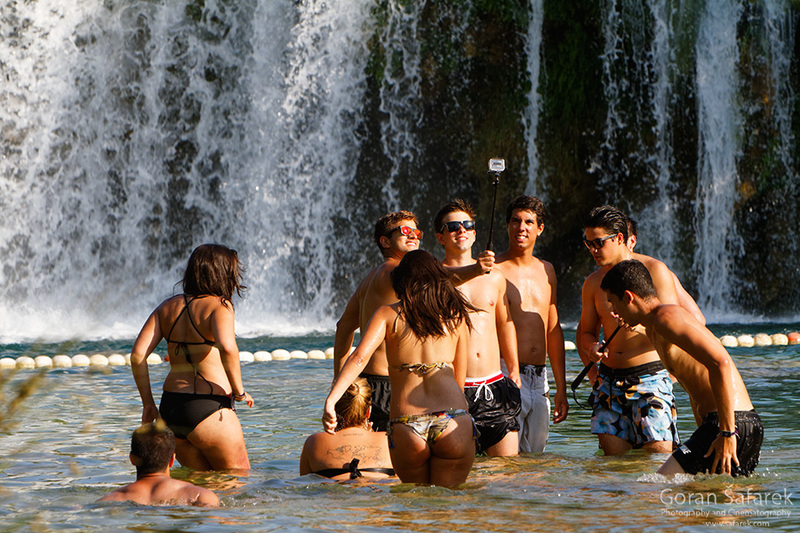 Just like Plitvice Lakes, Krka National Park is definitely not a cheap park. In the high season (summer months), the entrance fee will cost you 200kn for adult and 120kn for children older than 7. The entrance is free for children younger than 7. The exception is Roški slap that costs 100/40 and Burnum 40/30kn. There are many discounts though. If you come after 4 pm, the price is only 150kn for adults and 90 kn for children. Offseason in spring will also reduce the cost to 100kn for adults and 80kn for children, and even more in winter: 30kn /20kn. You can also pay for three visits to the Park within seven days from the date of purchase. (400kn for adults and 200kn for children.) Individuals with over 50% disability receive an entry free of charge upon presentation of an identification card. Individual students and members of the Croatian hiking society, upon showing identification receive entry price from the category “Individual children”. Except for the entrance fee, the ticket includes a single visit to all land sites in the Krka National Park, professional presentations and demonstrations on the Burnum archaeological collection, ethnic presentation at the water mills at Skradinski buk and Roški slap waterfalls, and Oziđana pećina cave, access to all educational hiking trails. The ticket also includes boat transport from Skradin –Skradinski buk and back (for individual visitors using the Skradin entrance) or bus transport from the Lozovac entrance, from Lozovac –Skradinski buk and back (for individual visitors using the Lozovac entrance).Bus transport from Laškovica –Roški slap –Laškovica and Bogatići –Roški slap –Bogatići (only during June, July, August and September). With the ticket, you can also board the train and boats – just keep the ticket with you all the time in case the park staff asks for it. Krka National Park lay just off the coast and a tourist hub of Šibenik, so there are numerous options to sleep. We will list here only the accommodation in the vicinity, for those that want to spend more time in the park. There is no accommodation inside the park. Lozovac is a small village above the Skradinski buk, where the main entrance is located and the bus national park station for visiting the park. There is a string of hotels and houses with private accommodation. 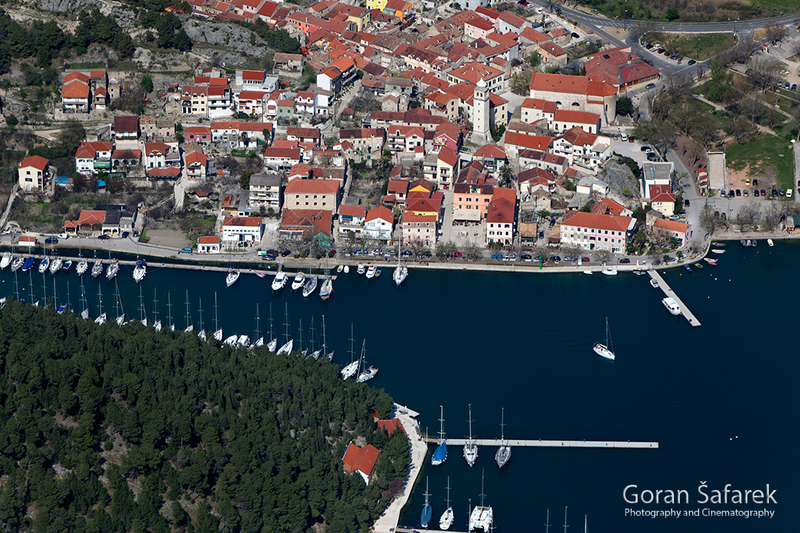 The lovely town and marina of Skradin is another excellent option for sleep near the park. The hiking trail and the boat tours to the national park start from Skradin. For those with campers or a tent, camping is another good option. Camp Krka is a family run campsite located only 2.5 kilometres from the Krka National Park, mid-way between Lozovac and Skradin. More than 70% of the campsite is situated in the shade of a pine forest. The campsite can accommodate up to 120 guests who can make use of the camp’s own bowling alley. The main attraction, the Skradinski buk waterfall is easily reached by public transport. But, there are other attractions, far between, while transportation is complicated by the rugged geography. The national park has, also, several boat lines. Slowly gliding in a white electric boat could be a great experience to witness both the river and wildlife. The ride from Skradin to Skradinski buk is a classic one, and it’s included in the ticket price. Then, there is another line, from Skradinski buk to Roški slap with a stopover in Visovac Island. Skradinski buk to Visovac is a 2 hour trip including a 30 minute stop on the small island of Visovac before returning to Skradinski buk. This trip costs 100 Kuna. Skradinski buk to Visovac and Roški slap is a 4 hour trip including a 30 minute stop on the small island of Visovac and 90 minutes at Roški slap before returning to Skradinski buk. This trip costs 130 Kuna. There is also a small boat ride from Stinice to Visovac, just across the river (that looks here like a lake). This trip costs 50 Kuna. Another boat line is from Roški slap to Krka monastery and the Trošenj fortress. A 2 and a half hour trip including a 30 minute stop at Krka Monastery before returning to Roški slap. This trip costs 100 Kuna. All these routes run between April and October. There are some limited options for hiking. Beside trails, there are few options. Remember, this is a country with little shade. “The Stinice – Roški slap – Oziđana pećina” Educational Hiking Trail is now open to visitors throughout the year and will be an authentic experience for all nature lovers, regardless of whether they decide to take a walk for a few hours, or a full-day excursion enriched with educational content. This hiking trials is fitted with educational panels providing detailed information about the plant and animal species specific to Krka National Park, geological phenomena and cultural and historical localities situated along the trail. The total length of the trail is 8.5 km, with an altitude difference of 176 m (from Lake Visovac to the parking lot), and the average walking time is 2.5 to 3 hours. For all other locations, you need your own vehicle. Details for getting there and parking will be given for the specific sites. This location is not in the national park, but deserves the attention. A source of the Krka River is located at the edge of Knin, where mighty and arid Dinara Mountain rises, is At the same time, it is the end of the Krčić River, a small stream that flows at the mountain foothill making a green oasis. Krić ends in a giant waterfall, Topoljski buk, where at the bottom, in the cave springs the Krka River. This is the mouth and the source at the same time. To get there, take a small road at the junction towards Split and Sinj. The sigh will lead you to the waterfall. There is a parking space and after that, and after the bridge, just a few minutes’ walks. The waterfall dries up often in the summer, but in spring, the refreshing spray will welcome you. It is possible to follow the Krčić River, hiking, riding a bicycle or driving in a car. Just go back until the first junction and turn right. The white road is good enough. The river banks offer lots of shade and meadows to relax in nature. Perfect for s lunch break or just rest on an arduous drive. Bilušića buk waterfall is often overlooked. It demands some hiking, but it worth the effort. 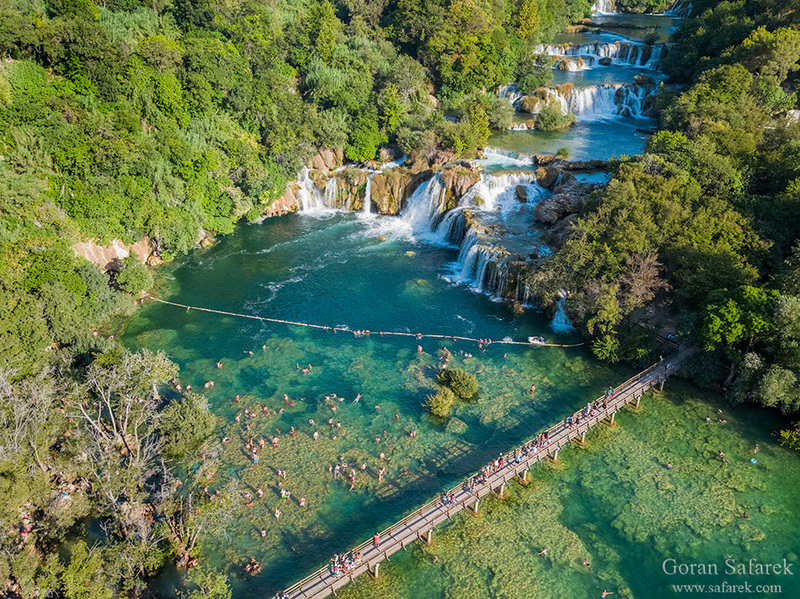 This is the first of seven cascades along the course of the Krka River. Very often, you are alone, unlike stomping on other feet on Skradinski buk. The waterfall is very photogenic. You can climb also above the waterfall. The cascade is made up of two main steps and several intermediate steps 300 metres in total length, with a total difference in altitude of 22.4 metres. The width of the waterfall is approximately 100 metres, but even during low water levels, the water flows through a cutting which is only thirty metres wide. Downstream from the lowest step, the river widens and the current calms. To see it, you need. The falls can be reached only from the Bukovac side via the road Knin-Kistanje by taking the turnoff at the village of Radučić (Omčikus) and continuing down the unpaved road to the Radučić railway station. To reach the ledge of the canyon, you must walk several hundred metres. From the edge of the canyon, there is a narrow path that leads to the river at the foot of the waterfall. From the Promina side, you can reach the waterfall via the road Drniš-Oklaj by taking the turnoff at the village of Gornji Čitluk; continue on this road to the village of Ljubotić. From Ljubotić, the unpaved road leads to the edge of the canyon where a ten minute walk will lead you to the waterfall. In the idle of Dalmatian arid, bushy hinterland are hidden Manojlovac waterfall. 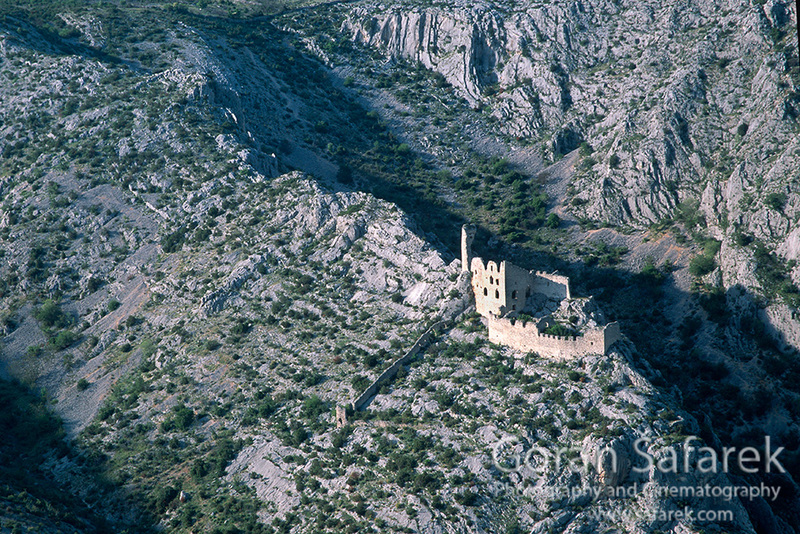 It is easily found along the road Knin – Kistanje. Manojlovac is the third waterfall in the series and the tallest. It is also rarely visited by the crowd, and this is a good thing. You can’t come close to it, however, only admire from a distance. The waterfall consists of a series of travertine barriers, with a total height of 59.6 m. The largest barrier is 32.2 m high. During periods of high waters, the waterfall crashes into the depths with a deafening noise, creating a veil of mist in a rainbow palette of colors. During the warmer part of the year, the waterfall is dry, as the water is channeled into the reservoir of the nearby Miljacka hydroelectric plant. In 2011, the trail with viewpoint was cleared and reopened to visitors. At that time, a plaque in honor of Austrian Emperor Franz Joseph I was revealed, as it was at this very spot that the emperor, together with his wife Elizabeth, admired the beauty of Manoljovac slap. Just several hundred meters from the Manojlovac Waterfall stands a gem of ancient history: the Roman military camp Burnum. It was erected at the turn of the new era, at a position that allowed for control of the passage across the Krka River. 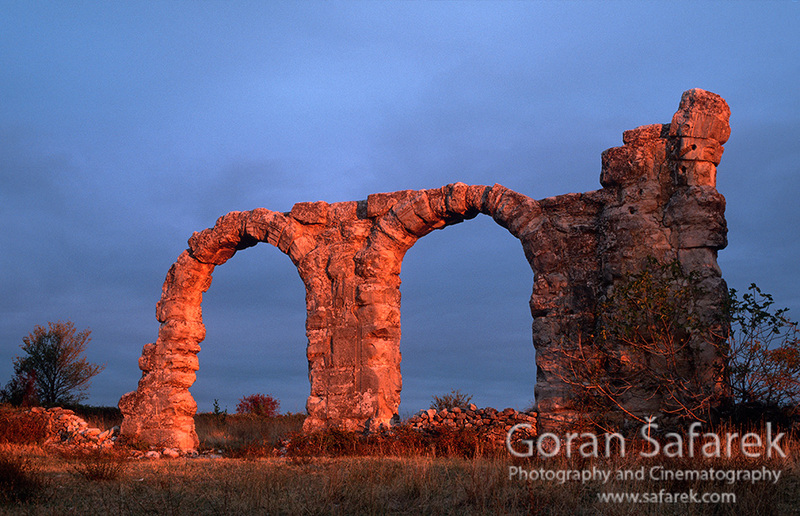 Visitors can view the arches of the command building in the camp, the only military amphitheater in Croatia (near the village of Ivoševci) and several walls of the military exercises area. The archaeological artifacts dug up from this locality (weapons, tools, daily use items) are on display at Puljane Eco Campus, opened in 2010. The location and archaeological collection are open for visitors during the whole year. 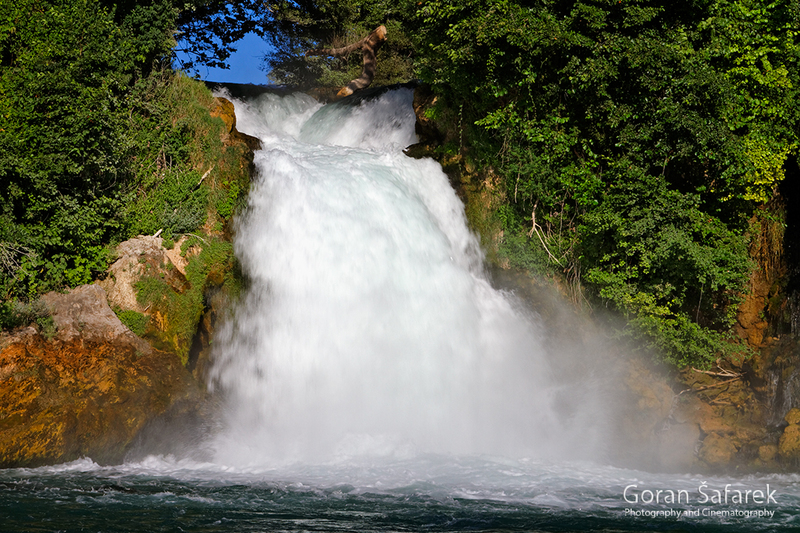 Burnum can only be reached by road, see Manojlovac Waterfall for details. The Krka Monastery (Holy Archangel), the spiritual centre of the Orthodox faith, stands 3.5 kilometres east of Kistanje, in a bay on the Krka River. Erected on the foundations of an earlier Eremite monastery, it was first mentioned in the written records in 1402, as the endowment of Jelena Šubić. A church built in the Byzantine style stands next to the monastery. Below the church there are ancient Roman catacombs, which are open to visitors. 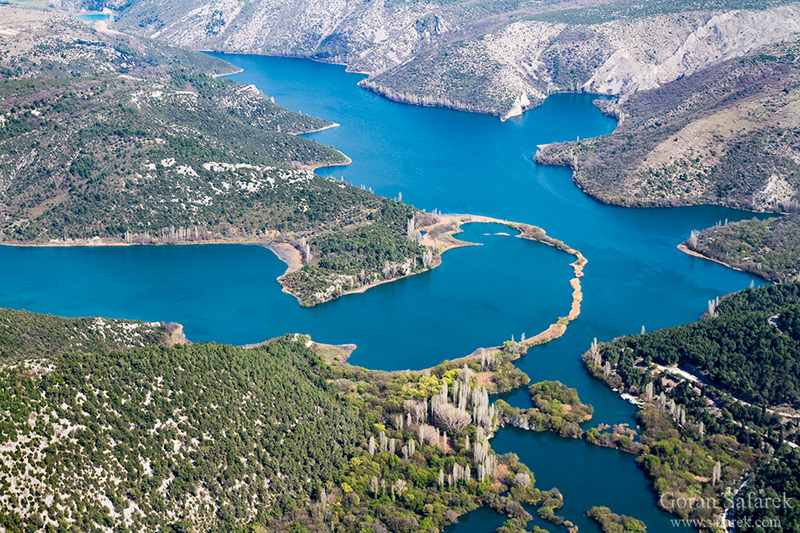 The monastery was named after the Krka River, which abounds here in plant and animal species, thanks to the water which provides them with life and the peace that is assured due to man’s absence. Visovac Island in the middle of the wide part of the Krka river, is among Croatia’s most valuable natural and cultural values. The Franciscan Monastery of Our Lady of Mercy, and the Church of Our Lady of Visovac, have stood here since 1445. With their magnificent surrounding, they form a unique harmony of man and nature. The monastery houses a valuable archaeological collection, a collection of historical church linens and dishes anda rich library, with several historical manuscripts, valuable books and incunabula. 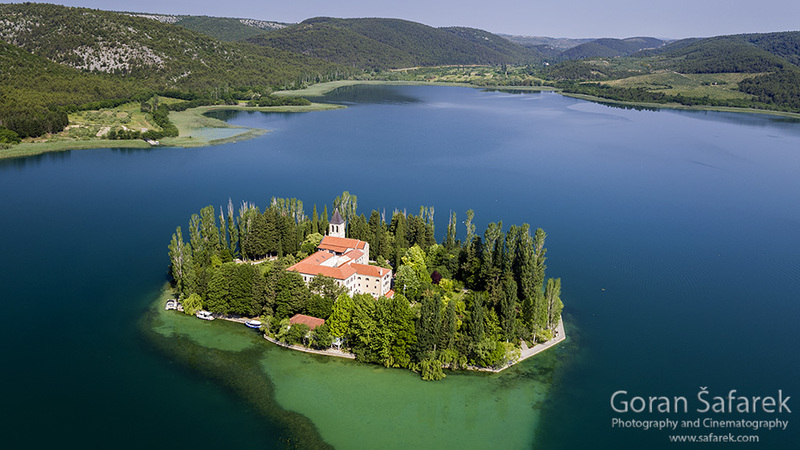 Visits to Visovac Island are possible by way of boat excursion from Skradinski buk, Stinica and Remetić (marked on the Krka National Park map). A visit to Visovac Island includes a 30 minute tour of the island, the Franciscan monastery, church and museum. Roški slap is also called the ‘vast waterfall’, and is made up of a 22.5 m high main waterfall and countless backwaters, cascades and travertine islands. 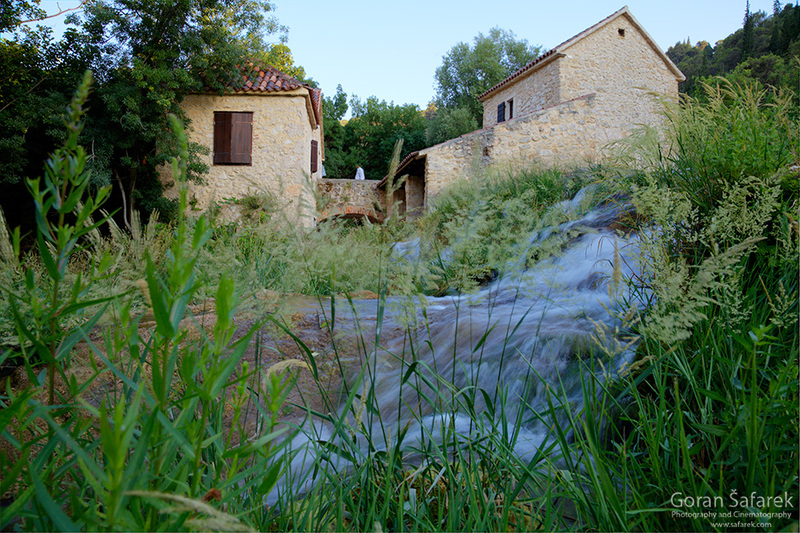 Roški slap is situated about 36 km downstream of the Krka River spring. The start of the barrier is made up of a series of small cascades (called the ‘necklace’ by the locals), followed by numerous backwaters and islets. You can completely encircle by foot these small cascades – terraces. Above Roški waterfall is Oziđana pećina cave, is a site of exceptional natural, cultural and historical significance. You can climb on 517 wooden steps. Over the waterfall, there is a road that dates back to Roman times. Throughout most of Roški slap, the natural environment is pristine and of great interest to nature lovers. On the left bank are a series of attractive water mills, several of which have been restored and returned to their original function. Some of them are turned to the restaurant where you can dine or just get refreshment in the shade. 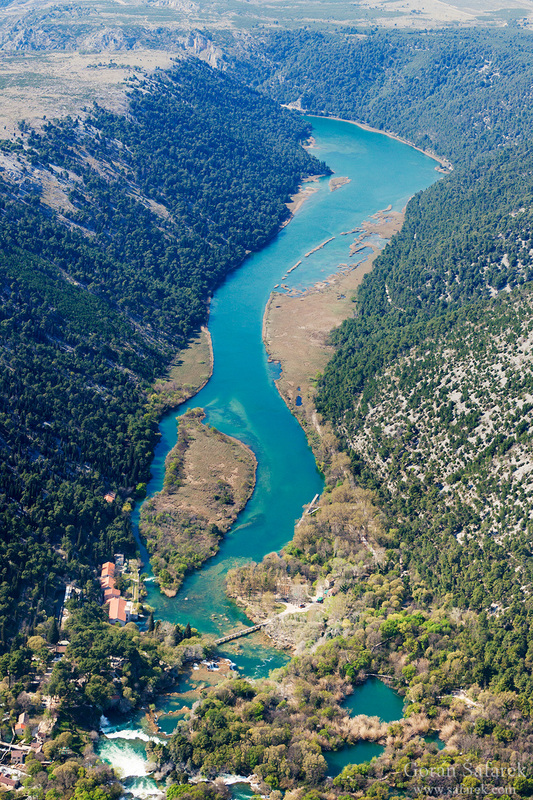 Roški slap can be reached by boat from Skradinski buk or with a car from two direction – east and west from Krka. There is a small parking at the entrance. Skradinski buk is undoubtedly the most famous attraction of Krka National Park. In the summer months, the footbridge across the river is congested with tourists! The cascades are composed of travertine barriers, islands, and lakes. They can be viewed throughout the entire year thanks to a network of paths and bridges that enable comfortable and safe walking. Several renovated water mills, rolling mills, and washing columns that for centuries have utilized the power of the river are also located at the Skradinski buk. Preserving the traditional folk architecture individual mills have been turned into souvenir shops, while others have been transformed into exhibition areas for ethnographic collections. 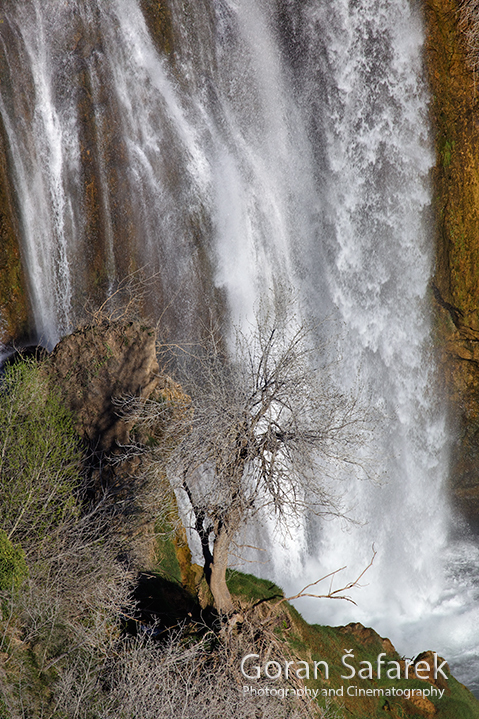 The Skradinski buk waterfall is the longest waterfall on the Krka River so it will take some time to see it all. The most famous scene with people swimming below the falls that is just the last, the lowermost cascade. There are plenty more. Basically, you can explore the upper parts of the waterfall, and climb up or down by either side. The upper Skradinski buk is a maze of wooden trails, in the deep shade of fragrant Mediterranean trees and bush. The river flows over the barrier in forms of the rapids and small waterfalls. Small pools or even the lakes are formed in all of shapes and sizes. You can enjoy nature, even meditate. Educational panels will help you to understand this natural wonder. Several viewpoints give you the perspective to the upper and middle cascades. You can descend to the Skradin entrance and the main waterfall on the right side of Skradinski buk (looking down) or go back to the Lozovac side, where ancient watermills are located. After exploring the cultural heritage, you can rest at the spacious viewpoints and marvel the art of nature. After that, descend through stairs to the lowermost cascades. This is the only place where you can swim. The right bank is a place to relax, on a small meadow with trees. Follow the safety instructions and don’t approach the cascade, it is much stronger than it looks like. The Skradinski buk can be reached from the Lozovac entrance, with free parking, while from April to October free bus transfers for individual visitors are available from the entrance to the Skradinski buk. The other entrance is in Skradin, where from April to November visitors to the waterfalls are transported by boats of the Krka National Park. Nature lovers and fans of hiking can reach the Skradinski buk along an 875 m trail from the Lozovac entrance or from Skradin, along with a 4 km trail that is also a bicycle path. Beware of very steep return phill to Lozovac and dust from the white road on a Skradin path. Excursions can be taken by boat from the Skradinski buk to Visovac Island and the Roški slap waterfall. After an arduous walk or swim, you can sip a coffee, beer or juice in several cafes or smaller booths with ice cream and fast food. The most beautiful ambient is a café at the old watermills. You can have a proper lunch near the Skradin entrance, with simple meals or local dishes, but beware of high prices (a portion of čevapčći costs more than 10€)! If you want to save some money, take some sandwiches and drinks. The ruins of several Early Croatian fortresses from the 14th century line the banks of the Krka River: Kamičk, Trošenj, Nečven, Bogočin and Ključica, one of the largest and most significant defensive structures in all of Croatia. Ključica fortress is the loveliest of all the fortresses, Ključica, which stood over the Čikola River canyon (a tributary of Krka). You can rech it by car, driving from Šibenik to Drniš, and turning left near the village og Goriš. Watch for signs. Drones are buzzing and zipping in the skies literally everywhere, but are not allowed and welcomed here. The fines are hefty. Camping is also not allowed.